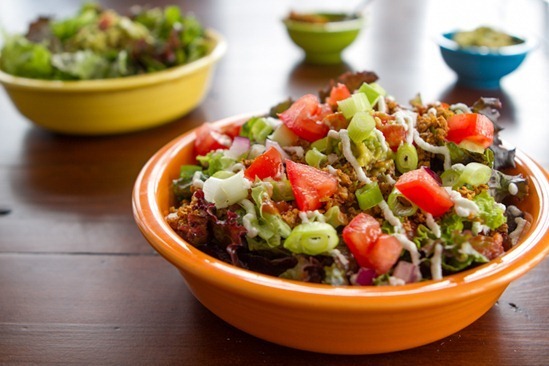 If you ever find yourself in a salad rut, this raw taco salad is a great way to break out of it. Hearty and flavourful, every bite is a fiesta in your mouth. It’s a bit (ok, a lot) different from the taco salad of my youth, but certainly no less tasty! My inspiration comes from the taco salad that I enjoyed at The Naked Sprout meet-up over the weekend. 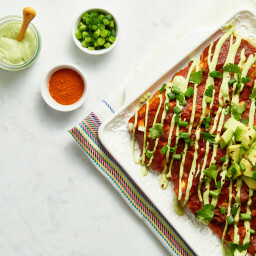 Layered with greens, guacamole, salsa, sunflower taco meat, and a cashew cream, I knew this was something I would be making at home real soon. As in, within 24 hours of consumption. I don’t mess around during the salad-a-day challenge…no sir-ee. I used walnuts instead of sunflower seeds for the taco meat. I’ve had success making walnut taco meat in the past, so I stuck with that recipe, only simplifying it to just a few ingredients. I made a macadamia cream sauce instead of a cashew cream sauce. Feel free to use whichever nut you wish. Red leaf romaine instead of flat-leaf mixed greens because I think the romaine has a better texture to serve as the base of such a hearty salad. Again, use any green you prefer. I used my Endurance Crackers because I had some in my freezer just waiting to be used. I absolutely loved them in this salad. 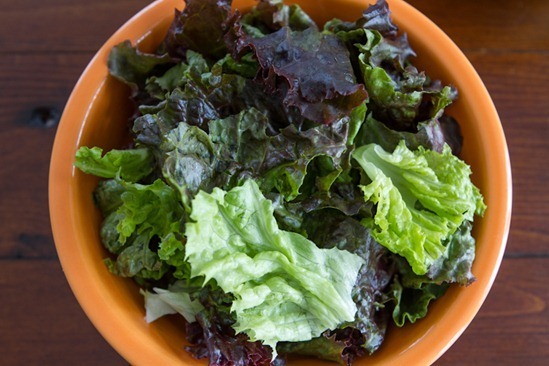 I put together a step-by-step assembly of the salad in photos for us visual people. The recipes are below! 1. Add a hearty base of greens in a large bowl. 2. 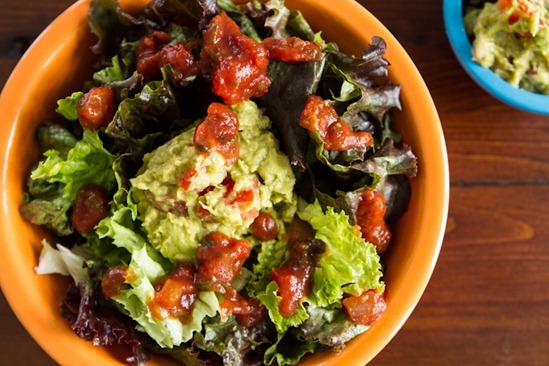 Add a heaping 1/4 cup scoop of 3-minute guacamole (recipe below) in the middle of the lettuce. 3. Spoon on a couple tablespoons of your favourite salsa. 4. Add half of the walnut taco meat. 5. Spoon a couple tablespoons of cream sauce into a baggie, snip off the end, and “pipe” it onto the salads. Fancy. Or, simply spoon it onto the salad directly. 6. Add chopped tomato, red onion, and green onion on top. 7. Finally, stick your favourite crackers in! I used my Endurance Crackers. Feel free to use tortilla chips or any cracker you see worthy. I like to think of this salad as a vitamin in a bowl. It’s not only delicious, but literally bursting with nutrients and health. It lasted all of 3 minutes in front of me…maybe less. Eric, who is not a guacamole fan, surprised me by devouring it also. Don’t let the long ingredient list put you off; the entire recipe took me about 30 minutes or so. Feel free to adapt this salad depending on what you have in your kitchen. Taco meat: In a food processor (or by hand), pulse (or chop) the ingredients until combined. Make sure to leave the walnuts chunky. Remove and set aside. Cream sauce: Drain and rinse the soaked nuts. Add them into a processor and process. Stream in about 1/2 cup water and a couple tbsp of lemon juice. Add more water as needed to achieve your desired consistency. The nut sauce should be super smooth and not grainy. Add salt to taste. 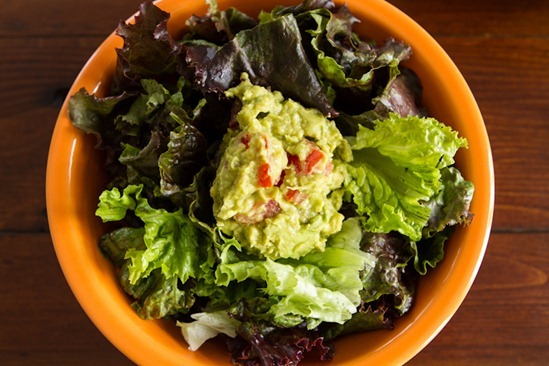 Guacamole: In a medium-sized bowl, mash the avocado flesh with a fork, leaving some chunks. Stir in the chopped tomato, red onion, lime juice, and seasonings to taste. 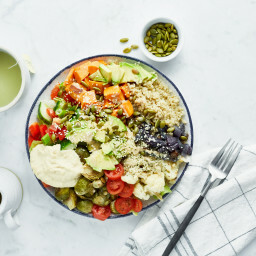 To assemble: (per bowl) Add a hefty base of greens in a large bowl followed by a heaping 1/4 cup scoop of guacamole in the middle. Spoon on 2 tbsp of salsa over the greens followed by half of the taco meat. Add a couple tbsp of cream into a plastic baggie, snip off end, and pipe over top the taco meat. Garnish with a chopped green onion and leftover chopped tomato and red onion. Place a few crackers into the salad before serving. If you find yourself with leftover lemon and lime juice like I did, place juice into a glass, fill with water, add liquid sweetener to taste, and serve over ice. The nut cream recipe makes a cup’s worth, so you might be wondering what to do with it the leftovers like I was. You can actually use nut cream as a sub for thick dairy cream in so many recipes. Think pasta sauces, cream-based soups, mashed potatoes, a spread on sandwiches or wraps, etc. Feel free to add herbs, spices, and seasonings to jazz up the flavour. I’ve also read that it can be frozen for a couple months. I decided to use some of the nut cream as a base for a sweet strawberry dessert and breakfast cream. Yummy. 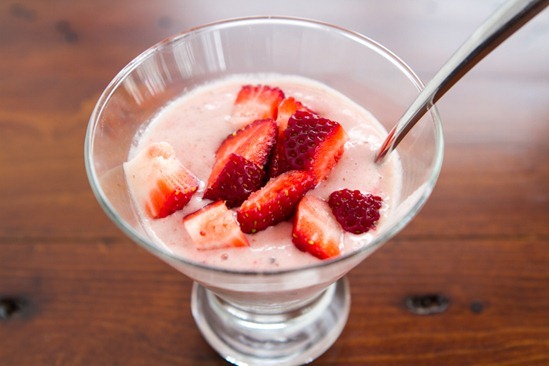 Enjoy this strawberry cream over top of oatmeal, vegan overnight oats, pancakes, desserts, or even in smoothies! 1. Add 6-7 large strawberries into a processor along with 1/4 cup nut cream and 1 tbsp pure maple syrup. 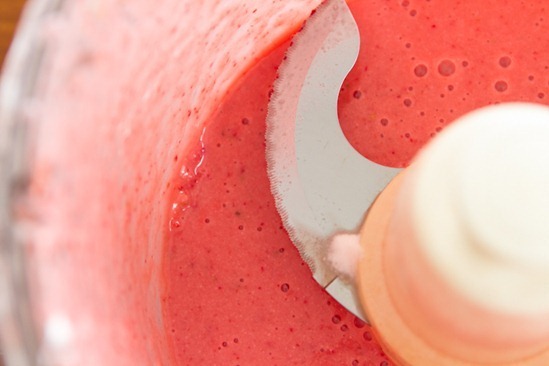 Remove strawberry cream and store in the fridge in a sealed container for up to a few days. 2. I made Banana Soft Serve with the strawberry cream. 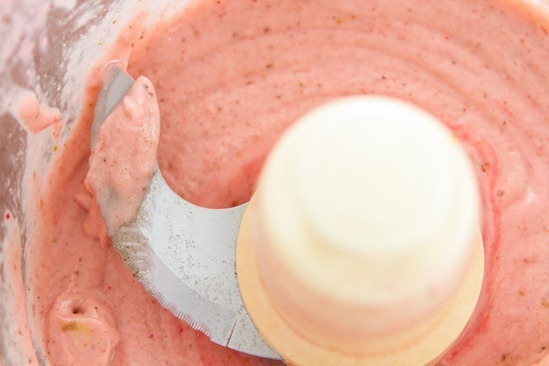 I added 2 tbsp of the strawberry cream into the processor with a frozen and chopped banana and 1/2 tbsp almond butter. 3. 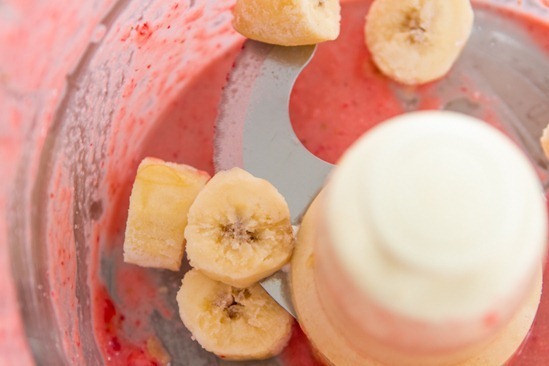 Instant “Strawberries ‘n Cream” banana soft serve! 4. Serve with chopped strawberries in a mini parfait glass for a cold & creamy summer dessert. I hope you enjoy it! Corn on the cob is a KILLER idea!!! I am kinda disappointed that all the reviews talk about how it LOOKS amazing and cant wait to TRY…. Reviews should be actual reviews and suggestions of the recipes. I just told my boyfriend that I was craving Mexican tonight but wasn’t sure what to make – such perfect timing! I am making that salad tonight! I think I’ve got all the ingredients. Lucky me, I also stopped at the fruit farm for the first berries of the season here in Ottawa. Thank you for giving us a great salad an dessert! Do you prefer macadamia or cashews for the cream? Hey Georgina, Let me know what you think of it! I think I prefer mac nuts (they are just so luxurious tasting), but I do find cashews to be cheaper so I use those most often. I also think cashews puree smoother in texture. It really doesn’t matter much either way! I have never heard of the walnut taco meat but you can bet I’m gonna see if I can sneak it past the Mr!! Can’t wait to try it! Goodluck, I hope he likes it. It adds a nice texture and flavour. Walnuts are the meatiest and sneakiest. I think your Mr. may approve!!! I’m so excited about this walnut taco meat! I’ve been looking for a replacement that wasn’t TVP or a crumbled soy product. Should be delicious…as is anything with guac! you’re right! that is a vitamin in a bowl! and it looks crazy delicious too! i love the piping of the cream:) and that strawberry cream — swoon! thanks for sharing! This looks amazing, one of my favorite things to do is recreate meals from restaurants! I will be making this very soon! Oh and if I don’t stream the water into the food processor while making the nut sauce will it still come out right? Your salad looks very similar to one I recently duplicated at home after a visit to Chipole Restaurant. I added black beans to mine though instead of the taco meat. It was delicious. But the taco meat looks really interesting. I am going to give that a try also. The strawberry cream also looks awesome. I am absolutely loving watching all these salads! Great challenge! Oh, this looks AMAZING! We’ve been making taco-seasoned chickpea salad with spicy dressing and it’s kind of a taco-themed salad, but it would be nice to try this one with the walnut “meat.” I have gotten bf hooked on salads this year and want to keep trying more veggie-based ideas. Thanks so much! Ah! We’ve actually just been drizzling chickpeas in olive oil, sprinkling them with taco seasoning, and then roasting them at 400* for 30 minute or so. Makes them nice and crunchy and super spicy/taco-flavored! But using chickpeas instead of walnuts would probably make good taco “meat”? Hmmm…now you have me curious, as well! I’m a new-ish reader and you may have this mentioned somewhere, but what kind of food processor do you have? yum! Reminds me of the Taco Salad at Rawlicious. 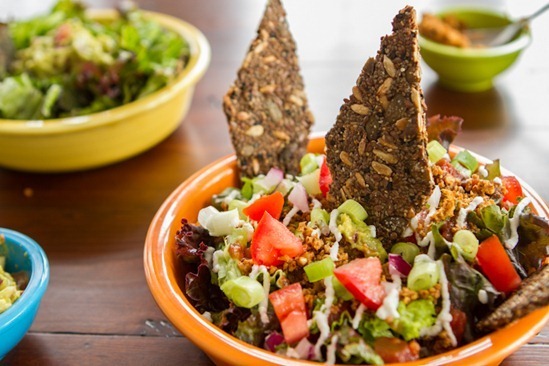 Thanks for sharing your spin on Raw Taco Salad! Especially like the idea of Macadamia nut cream – Sometimes I feel cashews get overused in raw foods, which scares me a bit when it seems some are quite sensitive to them. I’ll have to try! I will have to order that next time I find myself at Rawlicious…looove that restaurant. Me too.. So much that I work there ;) if you pop into the Yorkville location please say hi!! oh lucky you!! I have yet to check out the new location, but I’ve been dying to. Hopefully I will get there soon. What are your fav menu items? Actually, the taco salad! … And the taco wrap.. And the pad thai. Clearly, I eat about as much as I make there ;) have you tried the macaroons? Another fav! The summer menu just came out this past week-the summer fruit tart is mind-blowing!!! Oooh.. a new summer menu sounds great! I adore Rawlicious’ choco banana cheesecake! The Rawitch is also fantastic! no way i could miss the meat with this bad boy! yum! I want this for lunch! 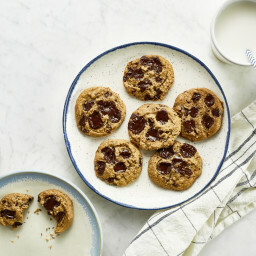 Are those raw cacao chips in the first photo? Matthew Kenney OKC makes some that look just like that. Holy moly, those both look delicious! I have to try your walnut taco meat, I love walnuts and Mexican flavored anything. 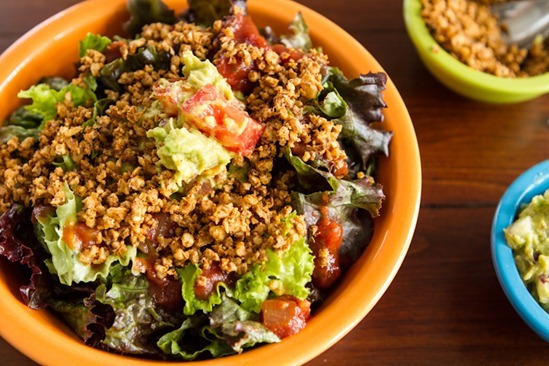 I love all of the different textures and flavors you have going on in this salad, and I like that you used walnut taco meat instead of the frequently used soy crumbles. I can’t wait to make this! Perfect timing! Was looking for new salads to try! 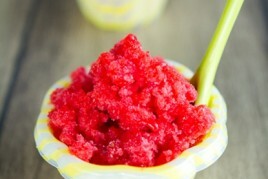 Also, the strawberry sauce looks delish! I have a request… I’d love to see some ideas for a summer BBQ. Side dishes preferably. I am going to try making your veggie burgers, but want something that will go nicely with them. This is one of my favourite BBQ salads: http://ohsheglows.com/2011/09/02/long-weekend-grilled-salad/ I hope to make more BBQ stuff too. You might want to also check out my recipage for other summer recipes. This is making me hungry! Good thing lunch is in 20min. I LOVE taco salad and tacos wrapped in lettuce so I can’t wait to try this. That salad looks great. I promise I’ve been eating salads even if I have not managed to tweet or INstagram about them. I wonder if I have time to make this salad….baby is FINALLY down for a nap! haha I forget to tweet them too. Often, I’ve consumed half of it before I remember to take a pic. Yummy! I actually made your endurance crackers recently, so I still have some left for this! Sending this link to my vegan sis, pronto. She’s going to be all over this one. Looks amazing! I have been on a taco-salad binge lately… except mine always has refried beans (vegetarian of course), fresh avocado because I’ve been a little lazy when it comes to guac, and a vegan mexi-ranch salsa type dressing I was inspired after waitressing at Applebee’s in my teenage years (hits the spot.) I really need to try making that sunflower or walnut taco meat though! This looks so good! Taco salads are one of my all time favorite meals! Anything I can put gaucamole on is good is my book! I will have to try this! 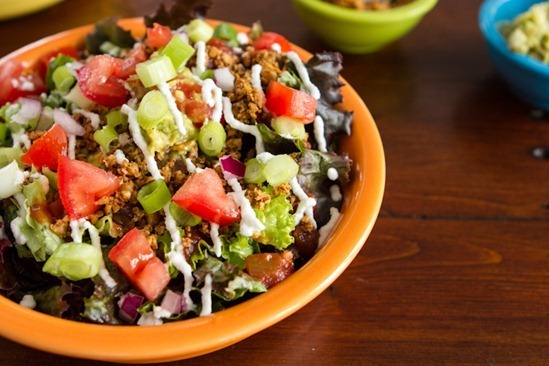 As for the taco salad, one of the first recipes I ever made for my blog 3+ years ago was raw taco meat/raw taco salad. I love the stuff and hate to even link back to it b/c the pics are bad (I should re-photograph it) but I just adore the flavors and yours looks delish! After seeing that taco salad yesterday, I was hoping for a recipe-inspired post. Looks super delicious — and know I know what dinner tonight will be! Oh my – walnut tacos and macademia sauce? Nut heaven! lol…I just see “Anna” in the above name field. What are you seeing? Ah now I only see Anna too! Before it said “1/4 cup onion, tomatoes..” and so on hahaha. Never mind, must have been a glitch! Thanks Ange! Hi Angela, this taco salad looks great! I would imagine you could! Soaking helps release the enzyme inhibitors for nuts and seeds. Yum! Sounds great. I wasn’t familiar with walnut taco “meat,” but it’s definitely interesting. Yummers!! I love the salad challenge. And hefty salads! **I am SO going to make some swamp water, btw. You have so many great healthy ideas!! This looks so tasty!! Love it! 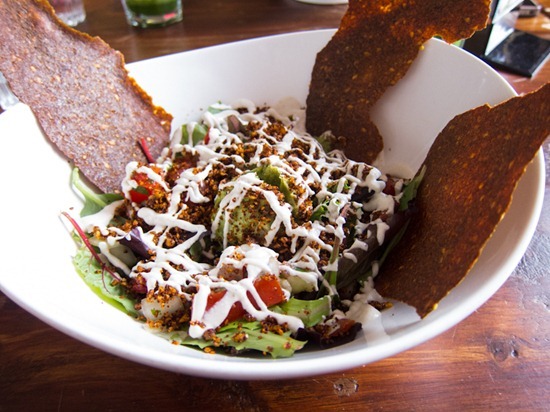 Yummm, love raw taco salad! I ate at the Naked Sprout in December (did a post here http://www.sweetlyraw.com/2011/12/naked-sprout-raw-restaurant.html) . While the salad was ok, it looks like they’ve worked in it since I was there. It was lacking in the guacamole/topping department. So nice that you had a meet up! Have you gotten to do a yoga class there? My boyfriend and I did a class and loved it. No I haven’t done yoga there yet, but I’ve been meaning to. My friend Heather loves it there! And I’ve heard great things about it. I have some walnuts left over from an arugula and walnut pesto so this is the perfect reason to use them. I adore this recipe! I’d maybe add some black beans as well to give it some heft. i’m sorry, but you can type “nut cream” and not make a joke about it? my goodness, i couldn’t stop giggling inside. bahaha, I didn’t even notice it. But that’s funny. Serves me right for writing a post at 630am! My husband and I became vegan 5 months ago. We have been tracking our grocery/take out bills to see the difference in our food spending. It has increased significantly. Has anyone else noticed this? I put all the food bills on my MC so it is easy to determine at the of the month. This past month we spent $730. I am sure there were also smaller amounts that I put on our debit card too. We eat everything that we buy too. I am not sure what to do or if this is normal. My husband is shocked and worried. We shop at the local Metro sometimes but most of the time at Planet Organic and the Bulk Barn for nuts, seeds, grains. Looks so delish! Perfect for a warm summer’s evening dinner…will print out! Also the banana soft serve is soooo ultimate…hadn’t thought to add strawberries! YUM! That looks and sounds delicious! I teach cooking skills to a couple, and they’ve been wanting more raw recipes for the summer. I’m definitely going to do this one and print out the recipe from your site. I often refer them here for inspiration. I really like that you demonstrated how to use the leftovers in a really great way!I always end up just throwing it into a smoothie, but I like this rendition better for variety. Makes me crave pancakes now. This looks sooo so good! inspired my salad making big time…one for the weekend methinks! Um. This may be the most amazing thing I’ve ever seen. I’m so glad I didn’t read this post until now. Otherwise I would’ve been drooling in front of all the kids at school. Have I mentioned how much you rock?! Thanks Madison, I hope you enjoy it! I never get tired of anything Mexican or Tex Mex…it’s just so good! I am really liking the sound of this raw taco salad! Thanks Kevin, I’m sure you could put some kind of fabulous spin on it…your recipes always look amazing! Wow that was speedy ,,,yum! Oh my goodness this was delicious. I made it for my honey and we just loved it. You have inspired us to stop buying the fake meat crumbles and use nut meat from now on! Stoked on the walnut taco ‘meat’. I usually cook up some spicey lentils as the base of my Mexican dishes but the walnuts would add such a nice texture. Going to make this on the weekend for my Fam. Thanks for the awesome recipe! Oh this looks delicious! I love taco salads!! This looks fantastic. I absolutely love making raw tacos, & a raw taco salad sound even better! Perfect warm weather fiesta food! The salad looks amazing and I love how you can take your basic salad and change it up with a few tweaks. It looks super delish! Made this last night for dinner for my bf and I. He was excited just by the look of it but after his first bite he declared “she’s outdone herself again” meaning you! Haha it was great! I used cashews too only because we had tons of them! I loved it and I seriously hate salad! Thanks so much! You’ve done it again. This is amazing!! Soooo yummy. You continue to keep my tummy full and happy. My husband loves your recipes too! Honestly – I’m just a little bit in love with you right now! This was SO DELICIOUS! I can hardly wait for my husband to get home and try his half of it. OH! and last night, I made your Tomato Basil Pesto Pasta, (which I say with reverence). You are a miracle worker. Seriously – it’s all just so yummy! and healthy! and vegan! and NO FAKE MEAT! (That stuff gives me the heebs.) I mean, the walnuts are kind of pretend meat, but not fake meat, y’know? THANK YOU! I’m a believer. Cashew cream sauce is amazing, and I’m glad to try a new nut (I bought macadamia nuts a while back for some mystery reason and I’m glad to find a useful purpose before they go bad). Sounds awesome! I often do a similar salad, but instead of any taco meat, I tend to use leftover rice and beans that I heat a bit, which wilts the greens ever so slightly. Since The Husband has this insistence that our house will implode if we don’t have some sort of chips, I have only used tortilla chips, but a heftier cracker sounds rather lovely, too! Thanks for the post – yum! Yum, the raw taco salads sound divine. It’s been awhile since I’ve made walnut taco “nut” meat. And I almost want to cry, I’m so happy; I’ve been looking for a nut-cream that doesn’t use cashews (found out I’m somewhat intolerant to cashews), and your macadamia cream sounds divine! Can’t wait to try this (probably this weekend)!! Nom! Nom! Nom! On my to-do list! Wow, you nailed this recipe! I love everything about it – can’t wait to try this! Thank you Lauren! I really appreciate it :) So glad you enjoyed it! This looks amazing! I’ve been seeing a few raw tacos recipes around and now I must make them! Thanks! I made these for a non-vegan friend tonight. She didn’t realize the “meat” was nuts and not fake meat until I told her. I thought these were amazing. And so did my fairly meat loving friend! Yum yum yum. I made a double batch of everything, including the cream which I didn’t use even 1/4 of. So, I have a ton of cream … suggestions for use? I made this last night and my boyfriend and I were incredibly impressed!! I was SO amazed at how spot on the flavor profiles of every component were with what is to be expected in a taco salad. We enjoyed every bit of it!! I didn’t have crackers on hand, but I did have some Garden of Eatin’ Red Hot Blues tortilla chips….I crushed them up on top of my salad and it was amazing! i have been obsessed with creating this salad since i saw this post…this weekend i’ll be making it…can’t wait!! My fiancee and I are not vegans but I came across your website and am in love with it. I just cannot believe it’s all vegan. I was a little skeptical at first,gave this recipe a try and OMG! We LOVED it! Taco meat with walnuts?!?! 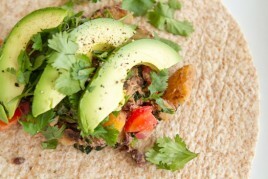 What the….now we are going to substitute our taco meat with this recipe because we actually like it better!!!! If vegan food taste this good you may just win us over so keep the recipes coming! I will be trying out more of your recipes soon. Thank you Jackie! So glad to hear that the taco salad was enjoyed so much. I hope you enjoy many more recipes to come! The raw taco salad was beyond amazing! I was a little weary of the macadamia cream sauce but when everything is all put together it compliments everything! The endurance crackers were a great addition! 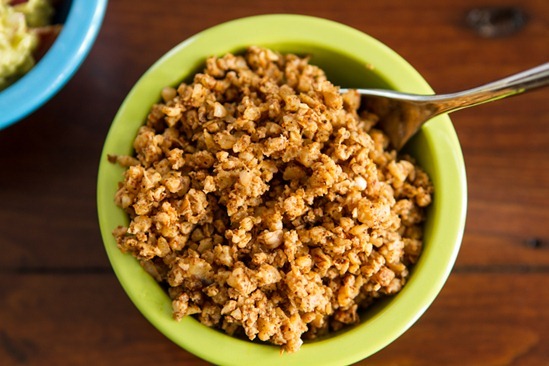 I’m truley in love with this recipe, easy, fast, filling and flavorful!! I made the salad earlier this week and my boyfriend and I loved it. I just made the strawberries n’ cream soft serve. I was out of nut butter so I just used the whole amount of the strawberry cream. So delicious! What a great idea. I LOVE The Naked Sprout! 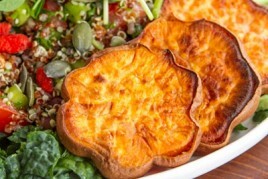 I’ve also had this salad there – can’t wait to try your version! I just made this entire meal for my family of 6, and everyone loved it – even my kids! The walnut taco filling was fantastic and had a terrific punch of flavor that we have all loved about the veggie ground we used to use. I plan to use this walnut ground for other dishes too – maybe even in a pasta sauce! Thanks as always for your incredible recipes! You are my go-to website for meal ideas for my large family and we have never been dissappointed! I just had this for dinner. It’s amazing! I’m definitely adding it to my dinner repertoire. Thanks for posting, I’m a big fan of your site. I made this today for the first time. Delicious! Loved everything about it. I used cashews instead of the macadamia nuts. The walnut taco meat was very tasty! I LOVE this salad. My mom eats completely raw and I am always looking for new recipes I can share with her….I tested it out before I served it to her and it has become a favorite for both my husband and I. Thanks so much for your wonderful recipes! I’m in love! I am not a vegan–not even a vegetarian yet–but I’m really working on more healthy meals for my family. We’ve added green smoothies and more salads and fruits overall. I’m leaning towards vegetarianism, but so many recipes just were too difficult, had strange ingredients, etc. Your site is amazing!! I am excited to try your recipes. Thanks for sharing! Made this for my daughter. Delicious! I used cashew butter for the nut cream and added the water and lemon juice to thin it and processed in Cuisinart. It was great. I did put some olive oil and lemon juice over the lettuce because I knew my daughter would like it better with some dressing on it. I used a ice cream scoop to put two scoops of guacamole on the lettuce. It was so cute and pretty and whole thing was incredibly tasty. She was surprised by how much she liked the walnut taco meat. The soaking of walnuts made all the difference and it was only for 2 hours. Thanks again for your creativity Angela! After you finish writing your book, please develop an app. I love your recipes! I just made this and it is awesome! The walnut taco meat is the BEST! I have a question about soaking the nuts – I’ve never done it before but think I read that when you do that you have to soak with salt and then dehydrate for 12-24hrs…. is that what you did here? Or did you simply put nuts in water and let sit for a few hrs and then rinse and immediately put in the food processor? Thanks for your help – I can’t wait to try this recipe out! Hi Erin, I try to soak overnight whenever possible! If Im short on time though I only soak for 30-60 minutes. Seems to always work out fine for me. This looks amazing! I love trying your recipes-they always turn out delicious. One question about the walnut “meat:” can you be a little more specific about how long to soak the nuts? How can you tell when they’re done? I’m trying to start a series of monthly challenges to encourage people – including myself! – to cook more vegetarian and vegan food, because as an omnivore myself, I’m trying to eat less meat, but find that when I get home from work, it’s easy to be overwhelmed and just revert to what is easiest. I’m hoping that slowly getting together an index of non-intimidating but delicious vegetarian recipes will help with that! 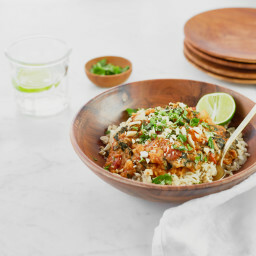 Made a version of this last night for our dinner–didn’t have time to soak, so I boiled the cashews for fifteen minutes and used Upton Naturals Ground Chorizo instead of the walnuts (though I’m so trying them next time). Wonderful! Gonna have to make this one soon, looks delicious! Made the raw taco tonight! Amazing!! Using walnuts as the “meat” is GENIUS! Angela, I love the ingredient list of your endurance crackers. I am dipping my toe into the raw world, do you think it would be possible with your for me to dehydrate the cracker. I made this last night and my husband and I both LOVED, LOVED, LOVED it! I will be making a double batch next week for my husband to take for his lunches. Thanks so much for the recipe! Dee-lish. This is a keeper. This was my first time to try cashew nut cream. My non-vegan friend even liked it! It’s already starting to get too warm here in the Southeast US, and my husband the non vegan suggested that we have this several times when it’s too darn hot to cook :) Yippeee! Just wondering if you used raw walnuts and macadamias in your recipe or roasted? Thank you! Also, do you think pecans would work instead of walnuts?? Thank you again!!! Hi Lindsey, I think I used raw, but honestly they might be even better roasted! yes I do think pecans would work, but I haven’t tried it yet myself. Let me know how it goes! Just curious how long do you normal soak the nuts for. I’m new to the whole vegan thing and could use some help. Also does it matter how much water you use? I usually soak for a minimum of 4 hours for cashews and overnight for almonds (since they are firmer). In a pinch, 1 hour works for cashews. I love this! I made this salad tonight and it tasted phenomenal. Even my carnivorous husband loved it. I’ll definitely make it again, although it took me longer than 30 minutes! Hey Angela! I made this recipe yesterday for my girlfriend (non-vegan) and myself, and she absolutely loved it, and I fell in love with it as well, it’s simply amazing! I wanted to ask you, I often look up recipes on www.vegweb.com, would you agree for me to post your recipe there, and give you full credits (along with the link)? I feel like this recipe should be shared with the vegan community on this website as well! Hi Nick, So glad to hear that! Thanks for trying it out. As for re-posting recipes, I ask that they aren’t copied and re-posted (only because they take a great deal of work to create for my blog) – but feel free to post the link if you’d like to share. Thanks and let me know if you have any other q’s. Made this for lunch today and OMG it was amazing. Thank you so much. I just tried this salad, minus the nut cream because I didn’t have those nuts on hand, and it was so delicious. It definitely satisfied me and my craving for something Mexican. I’ve tried a handful of your recipes since discovering your site about a week ago and everything has been to die for. Thank you Angela! Made this tonight and it was super yummy!! I’m just wondering if you ever worked out the nutritional content for this meal?? Trying to add up how much protein we are getting. If you know that would be great! This recipe rocks. It tastes like it should be bad for you! I just made this for dinner and it was so delicious! I was nervous about the walnut taco meat, as I’ve never used them this way before, but it turned out amazing. It was so fast too. If I wanted to use raw sunflower seeds instead of walnuts would I increase the amount to 1 cup? And do I need to do any soaking for sunflower seeds? If I wasn’t trying the Whole30 challenge I’d go for the walnuts myself! wow! I just made the taco salad and my goodness it is incredible ! seriously recommend anyone making this…so so tasty. Thank you for the recipe! This was a HUGE hit with my 15 yr. old daughter! Didn’t have time to soak any nuts. Walnut meat and cashew cream came out gorgeous. Used sprouted walnuts from store (I didn’t sprout) and roasted cashews – both unsalted. Added garlic to the guacamole because huge garlic fans. We put in romaine hearts and made little taco boats. All the flavors came together so well – Amazing! I just made this Taco Salad for my wife and me. I followed the recipe exact, and I have to admit, this is one of the best salads I have ever had. My wife and I both LOVED it!! My wife stated that she felt like we were at a high dollar raw food restaurant. Absolutely great recipe. Will definitely be including this meal in our meal rotation. Thanks. I just made this and it was REALLY delicious. I’m transitioning to a vegan lifestyle, and my friend introduced me to your website. It is brilliant. There are quite a number of vegan recipes out there that make me feel like I’m being punished when I eat them. All of your recipes I’ve tried have rich flavor profiles and satisfying consistencies. I think this one will be popular in my rotation! WOW!!! I just made this for dinner and it is truly the best salad I’ve ever tasted! This is Devine! Thank you so much Angela! I FREAKIN love you! That is all…as you were. Had this for dinner a couple nights ago… Just AWESOME! 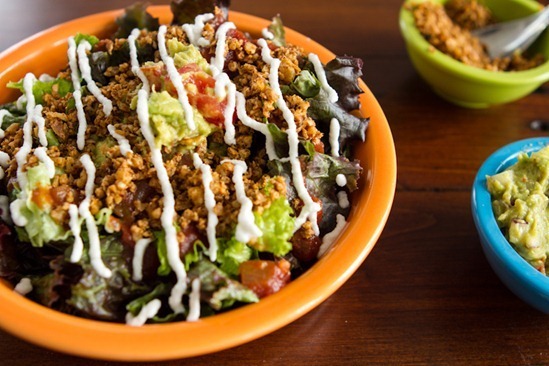 So much flavor and deliciousness… I have been making vegetarian taco salad for years using the vegetarian soy crumbles, but lately I have been trying to eat more real, plant-based foods. I loved the idea of a raw vegan taco salad and it definitely surpassed my expectations. Sadly my fiance will rarely participate in my vegan meal experiments so I made him his own meat to go on his salad. I was surprised by the cashew (did not have macadamia nuts) cream – this was my first time soaking and blending cashews. It worked very well on the salad. I even brought leftovers for lunch at work the next day and it was yummy once again! I also took you up on the idea for strawberry nut cream blended into banana soft serve. My fiance and I BOTH enjoyed that creation! Thank you once again for making eating vegan fun! My neighbor made this last night for dinner, they are all meat eaters and I am vegan. It was absolutely delicious and everyone including her husband and picky 8 yr old daughter loved it. We will definitely make this again and again. I’ve made this salad multiple times for lunch and both my husband & i LOVE it! I make it ahead for the week in our mason jars & it works great! I skipped the cashew cream (read i got lazy) and added some green chilies and tiny bit of garlic to the guac. it turned out just perfect for us! Thanks for this & many other wonderful recipes on your blog! I made this recipe awhile ago now, and I have to say it is absolutely FANTASTIC! Do you have a newsletter email? This has to be the most delicious taco salad I have ever eaten. I cannot wait to make this! Already had lunch, but pretty much drooling looking at the recipe. Any ideas on the longevity of the cashew cream in the fridge once you’ve made it? Thanks! This was delicious! My husband and I had it for dinner, except I used yogurt instead of the vegan sour cream and added cheese because we aren’t vegan. I love eating vegetarian meals because they make me feel wonderful and they save me money!!! I had basically everything I needed on hand. I added homemade salsa and garbanzo beans (for extra protein) and just did diced avocado instead of guacamole to save time. The walnut mixture was great and easy, and so much cheaper than ground beef! Especially if you like to buy organic/grass-fed. How long does the cashew cream / strawberry cream last in the fridge? Hi Caty, The cashew cream will stay fresh in an airtight container in the fridge for up to 1 week, or in the freezer for 4 to 6 weeks (I love freezing in individual-size servings using a muffin tray or ice cube tray!). I’d say strawberry cream can be stored in the fridge in an airtight container for up to a few days. Hope this helps! I don’t make them completely raw…I usually fry up an onion and some garlic and then add the walnuts chopped and pre soaked. Play around with chili powder and other spices…sometimes I add a little oregano. Made this for the first time tonight and my wife and I both loved it! I expect we’ll make it several more times over the summer! That’s great, Bill! So glad you both enjoyed it. FYI…The link for you have for the naked sprout needs to be changed…a bit inappropriate. But the salad looks great!